NOTE: Date must be in the form YYYY-MM-DD, like 2019-04-06. She loved quilting and also enjoyed horse racing, going to the Kentucky Derby and UK basketball. Doris Jean Hadley of Campbellsville, died Thursday, April 4, 2019 in Campbellsville at age 83. Her services will be held at 12noonCT/1pmET Monday, April 8, 2019 at Parrott & Ramsey Funeral Home in Campbellsville by Rev. J. Alvin Hardy. Visitation is from 10am-1pmET Monday, April 8, 2019 at the funeral home. Burial will be in Campbellsville Memorial Gardens. 2019-04-06 - Adair County, KY - Photo from the office of Adair County Judge Executive Gale Cowan. Workers at the PRIDE Cleanup today included David Karnes and his son Brody, and Magistrate Terry Hadley. 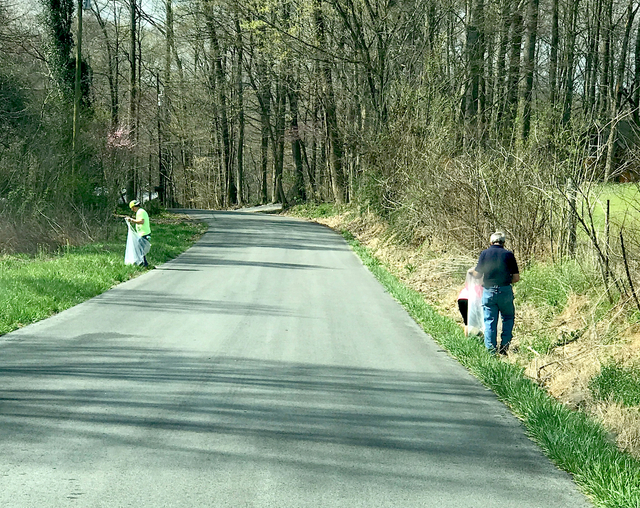 They are working in this photo on Taylor Ford Road. Religious Services will be held at H.E. Pruitt Memory Chapel, Jamestown, KY, at 1pmCT on Monday, April 8, 2019 with Bro. Billy Dunbar officiating. Friends may visit Monday starting at 11amCT at the funeral home. Interment will follow in Ragen Cemetery. He had been a Minister for 62 years for 13 different churches, and served on four missions trips with the International Mission Board to Brazil and the Philippines. His wife of 60 years, Mary Lou Kiper Hadley, survives. Bro. Alfred Landon Hadley of Campbellsville, Kentucky, son of the late James Oris Hadley and Susie Antle Hadley, was born on Thursday, May 20, 1937 in Cumberland County, Kentucky and departed this life on Friday, April 5, 2019 at age 81 years, 10 months, and 16 days of age. The funeral services will be at 2pmCT/3pmET Monday, April 8, 2019 at the Green River Memorial Baptist Church with burial to follow in the Green River Cemetery. Bro. Steve James, Bro. Wilburn Bonta, and Bro. Jamie Bennett officiating. Visitation is requested from 4:30-8pmCT Sunday at the Cowherd and Parrott Funeral Home; from 7-9amCT Monday at the funeral home, and after 10amCT Monday at the church until time of the funeral service. Pallbearers: Kim Bailey, Curtis Judd, Dean Antle, Victor Matney, Jason Keltner, Jim Collison. Honorary Pallbearers: Deacons of all his past churches. Everyone is welcome to attend opening day at the Joe Johnson Little League Park in Columbia Monday, April 8, 2019. The City of Columbia and numerous volunteers have been working hard to make pre-season improvements at the park. The ceremonial first pitch will be held on Field One between 6:50 - 7:10pmCT. Andy Watts will serve as announcer. William Dennis Simpson of Greensburg, Kentucky, son of the late James Ogden Simpson and Margaret Woolridge Simpson, was born on Thursday, May 28, 1936 in Green County, Kentucky and departed this life on Friday, April 5, 2019 at the Jane Todd Crawford Hospital. He was 82 years, 10 months, and 8 days of age. The funeral services will be conducted at 2pmCT Sunday, April 7, 2019 at the Cowherd and Parrott Funeral Home with burial to follow in the Green County Memory Gardens. Bro. Larry Wisdom, Bro. Nathan Crawford, and Bro. Mark Lile officiating. Visitation is requested from 3-8pmCT Saturday and after 7am Sunday until time of the funeral service. Pallbearers: Ricky Simpson Bryon Simpson Andy Judd, J. Simpson Kyle Judd and Dr. Shane DeSimone. Honorary Pallbearers: Deacons of Fry Baptist Church. The Red Cross program still has an inventory of FREE smoke alarms. Volunteers will install them at no cost. You can save lives in your family by making sure your fire alarms are up to date. American Red cross volunteers in Adair County have installed free smoke alarms in 79 homes in Adair County since July 1, 2018 and hope to install smoke alarms in at least 100 homes in Adair County by June 30, 2019. All you do to arrange for your free smoke alarms, installed at no cost by with local volunteers is call 1-859-951-7814 (The "1" is not needed if calling from a cell phone). You will be contacted to set up an appointment for free smoke alarm installation by a local Red Cross volunteer. The latest results of chronic wasting disease testing of Kentucky deer and elk returned encouraging news: none of the tests came back positive for the fatal brain disease that affects members of the deer family. The Kentucky Department of Fish and Wildlife Resources' monitoring of the state's deer and elk herd for chronic wasting disease (CWD) will be among the topics covered at four public CWD forums planned across the state in the coming weeks. The first of these informative community forums is scheduled at 6 - 8 p.m. (Central) on Thursday, April 18 at the Camp John Currie dining hall, 295 Camp Currie Road, Benton, KY. The camp is on the shore of Kentucky Lake. Times, dates and locations for the remaining forums will be announced later. A worker who took Guy's order at a drive-thru window as he specifically said: "no cheese on that burger" at least three times is labeled an idiot when Guy gets home with a cheeseburger. "I told that girl three times only meat and a bun. Meat and a bun. Three times. Here is what you get. A cheeseburger." We all know kids who do a good job, but he didn't meet any that day. When Guy offers to bring me lunch but has to tell the person at the window he wants a "plain" anything, he takes it personally, as if I have somehow caused him severe embarrassment. "If you ate food like everyone else, this wouldn't happen." Campbellsville, KY - Dr. John Chowning, executive assistant to Campbellsville University's president for government, community and constituent relations, presented Dr. Elijah Brown with the Campbellsville University Leadership Award "for having demonstrated years as a Christian servant leader." During his message, Brown asked, "What was the single greatest miracle performed by Jesus, besides the resurrection? The feeding of the 5,000. It is the only one recorded in all four gospels, so it must have been one of the greatest." Libby and I made our first and only trip to St. Augustine in June of 2012. Unfortunately, Tropical Storm Debbie decided to make her way there at the same time. Rained 17 inches in about three days. The Suwanee River reached record flood levels and at times on our way out of the area two days after Debbie's passing, the water was onto the edges of main highways and even Interstate 75 in places. The Lindsey Wilson softball team travels to Georgetown (KY) on Saturday April 6 NoonCT for Mid-South Conference action at the Tiger Softball Complex, Crawford Dr, Georgetown, Kentucky. Softball had originally scheduled to play a doubleheader on Friday but with wet field conditions the game is postponed with a makeup date to be announced later this weekend. The Blue Raiders (25-1, 8-0 MSC) returns to the dirt after defeating Midway (KY) 9-0 and 9-3 on Tuesday afternoon. --Robert Stone, Saturday, 6 April 2019. Kentucky Agriculture Commissioner Ryan Quarles is scheduled to speak at the Edmonton-Metcalfe County Chamber of Commerce Breakfast, Leftwich Hall, 1608 W. Stockton St., Edmonton, KY, at 7amCT on Tuesday, April 9, 2019. Frankfort, KY - As warm weather sweeps across the Commonwealth bringing signs of spring, motorists can expect to see orange cones and flashing lights on roadways as construction and maintenance activities resume. The Kentucky Transportation Cabinet (KYTC) is driving attention to National Work Zone Awareness Week (NWZAW) - April 8-12 - to encourage motorists to take a vested interest in work zone safety by slowing down and driving without distractions in active work zones. Portsmouth, OH - Lindsey Wilson baseball could not sustain its early momentum today in a 9-7 loss to host Shawnee State (Ohio) at Branch Rickey Park. Lindsey Wilson and Shawnee State will complete the three-game series on Saturday with a doubleheader beginning at NoonCT at Branch Rickey Park, 25 Mary Ann St, Portsmouth, OH. The Blue Raiders (7-22, 2-8 in the Mid-South Conference) scored five times in the top of first inning, but managed just two runs over the final eight in the loss. Lindsey Wilson recorded its 11th double-digit hit game of the season, but also stranded 12 runners, including leaving a runner aboard in all but one inning in the setback. Sloppy Joe Sliders, Chips, Veggie Sticks with Dip, and a variety of homemade Cookies! As always, others are welcome to eat for a donation.